Francis, whose much-anticipated encyclical on the environment will be released before this year’s U.N. climate change conference in Paris, isn’t alone in viewing faith and environmental justice as inherently linked. In a study last November, the Public Religion Research Institute (PRRI) found that 73 percent of Hispanic Catholics in the United States are “very” or “somewhat” concerned about climate change, higher than any other religious/ethic group in the study’s breakdown. Such high levels of climate awareness do not extend to all American Catholics, however: Just 41 percent of white Catholics report climate change concern, lower than every religious group but Evangelical Christians. Is indifference consistent with church teaching? “The Catholic teaching on care for creation goes back to Genesis,” says Dan Misleh, executive director of the Catholic Climate Covenant, citing St. Francis and St. Thomas Aquinas, and the three most recent popes, as environmental advocates. Misleh’s organization coordinates the Catholic Coalition on Climate Change, a network of thirteen organizations [.pdf] that includes the United States Council of Catholic Bishops (USCCB). The coalition teaches that all seven principles [.pdf] of Catholic social teaching support and inform a mindset of climate concern and activism. Perceived vulnerability to the impact of climate change may explain the level of concern expressed by Latinos. Close to half (43 percent) of Hispanic Catholics—higher than any other religious group—told PRRI they expect to experience personal, substantial harm from climate change. 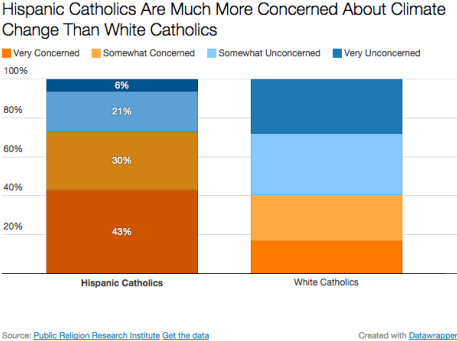 Only 13 percent of white Catholics said the same. Studies show American Latinos are disproportionately exposed to air pollution and human-caused environmental damage. Hispanic children are 40 percent more likely to die from asthma than non-Hispanic, white children. And nonwhites breathe 38 percent higher levels of a pollutant linked to heart disease, low birth-weights, and asthma and decreased lung function in children. In another poll, 83 percent of American Latinos told the National Resources Defense Council (NRDC) they believe climate change is hurting low-income communities in Latin America. Latinos are motivated by a “deep personal sense of our global interconnectedness,” Quintero has written, “not only to our family members who join us for dinner around the table every night, but for our extended network of cousins, aunts and grandparents whether they live here in the U.S. or abroad.” That could be why 86 percent of Latinos in the NRDC study cited a “moral duty” to preserve the planet for children and to respect ancestors’ legacy of care for the earth. Latino Catholics are also more likely than any other religious group to say their congregation sponsors climate change-related activities, and that their clergy discuss the issue (white Catholics, unsurprisingly, hear the least about climate change in the pews). Those who hear climate change discussed frequently in sermons are 13 percent more likely to believe it is real and caused by human activity. Miami Archbishop Thomas Wenski spoke of the upcoming encyclical at a briefing on religion and climate change sponsored by the National Religious Partnership for the Environment (NRPE) in Washington, D.C., last month. He predicts the pope will discuss the “interrelatedness of the various social, economic, political, or environmental crises” faced by humans today. The NRPE briefing aimed to educate and influence members of Congress. In January, the U.S. Senate voted down an amendment (fifty to forty-nine) acknowledging that “human activity significantly contributes to climate change,” thanks in part to a number of Catholic climate-denying officeholders. She says the reality of lower-income, globally minded Latino climate activists belies the stereotype of the “Prius-driving, Whole Foods-shopping” environmentalist. “If we really look at environmentalism as a value—and I think this is where religion really comes in—if you look at the fact that protecting our surroundings will determine a lot of how our children will live, then you can really start to understand why this is such an important issue for the Latino community. Katie Rose Quandt is a reporter for BillMoyers.com. Her work has appeared in Mother Jones, America, and In These Times.